By now, we are all sadly familiar with the ghastly specter of robust young men, former athletes supposedly in the prime of their lives, lapsing prematurely into depression, dementia and sudden, violent death, often by suicide. A large and expanding body of evidence points to an insidious, progressive-degenerative neurological condition brought about by "repetitive, mild traumatic brain injuries," such as might be sustained by football players over the course of their careers, as the cause of this devastating cognitive decline. Its name? Chronic Traumatic Encephalopathy, or CTE. Note that these repetitive injuries need not meet diagnostic criteria for concussion and indeed, often go unnoticed as they occur. Lincoln, MA's Doctor Robert Cantu and fellow researchers have just published an important paper in the journal Brain, describing the causes and inexorable course of CTE, and the mechanisms by which it works. Their study, the largest of its type yet undertaken, involved post-mortem analysis of 85 brains donated to the Center for the Study of Traumatic Encephalopathy at Boston University, which Cantu co-chairs. All of the subjects were male, and ranged in age from 17 to 98 years (mean: 59.5 years). You can, and should, read the entire study HERE. The group including 64 athletes, 21 military veterans (86% of whom were also athletes) and one individual who engaged in self-injurious head banging behavior. Eighteen age- and gender-matched individuals without a history of repetitive mild traumatic brain injury served as controls. There was evidence of CTE in 68 of the subjects! "Symptoms in stage I CTE included headache and loss of attention and concentration. Additional symptoms in stage II included depression, explosivity and short-term memory loss. In stage III, executive dysfunction and cognitive impairment were found, and in stage IV, dementia, word-finding difficulty and aggression were characteristic. Data on athletic exposure were available for 34 American football players; the stage of chronic traumatic encephalopathy correlated with increased duration of football play, survival after football and age at death. CTE was the sole diagnosis in 43 cases (63%); eight were also diagnosed with motor neuron disease (12%), seven with Alzheimer’s disease (11%), 11 with Lewy body disease (16%) and four with frontotemporal lobar degeneration (6%). There is an ordered and predictable progression of abnormalities through the nervous system in chronic traumatic encephalopathy that occurs in conjunction with widespread axonal disruption and loss. 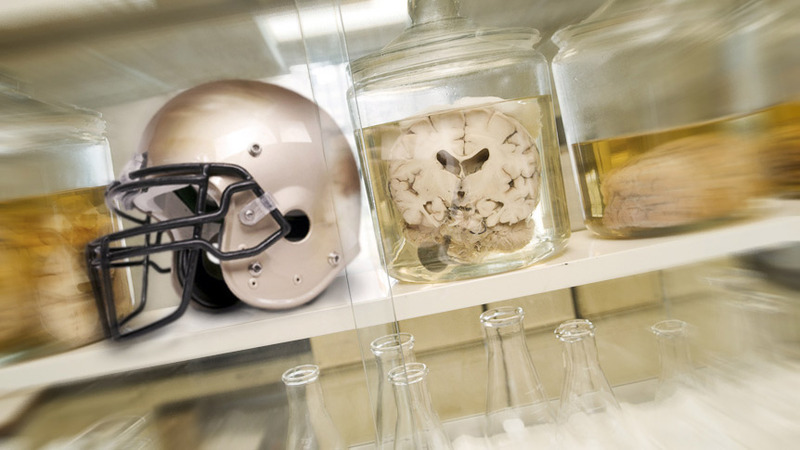 The frequent association of chronic traumatic encephalopathy with other neurodegenerative disorders suggests that repetitive brain trauma...promote(s) the accumulation of other abnormally aggregated proteins."